Controversial South African hunter Dawie Groenewald and his brother, Janneman, were indicted in Washington yesterday on charges related to the fraudulent hunting of “problem” rhinos. The duo, who own Out of Africa Adventurous Safaris, allegedly laundered the horns of the rhinos on the black market. They were charged with conspiracy to sell illegal rhinoceros hunts in South Africa in order to defraud American hunters, money laundering and secretly trafficking in rhino horns. The indictment charges Dawie Groenewald (46), his brother, Janneman (44), and their company, Valinor Trading cc, with conspiracy, violations of the Lacey Act, mail fraud, money laundering and structuring bank deposits to avoid reporting requirements. The Lacey Act, the nation’s oldest criminal statute addressing illegal poaching and wildlife trafficking, makes it a crime to sell animal hunts conducted in violation of state, federal, tribal and foreign law. According to the 18-count indictment, from 2005 to 2010, the Groenewald brothers travelled throughout the US to attend hunting conventions and gun shows, where they sold outfitting services and accommodations to American hunters to be conducted at their ranch in Musina, Limpopo. During the time period covered by the indictment, Janneman Groenewald lived in Autauga County, Alabama, where Out of Africa maintained bank accounts and is accused of money laundering and structuring deposits to avoid federal reporting requirements. Hunters paid between $3 500 and $15 000 for the illegal rhino hunts. “The defendants are charged with selling illegal rhino hunts by misleading American hunters. The hunters were told the lie that a particular rhino had to be killed because it was a ‘problem rhino’,” said Sam Hirsch, acting assistant attorney general for the Justice Department’s Environment and Natural Resources Division. “While no trophy could be legally exported, the hunters could nonetheless shoot the rhino, pose for a picture with the dead animal, and make record book entries, all at a reduced price. The indictment alleges that the defendants then sold the rhino horn on the black market. Eleven illegal hunts are detailed in the papers filed in federal court, including one in which the rhino had to be shot and killed after being repeatedly wounded by a bow, and another in which Dawie Groenewald used a chainsaw to remove the horn from a sedated rhino that had been hunted with a tranquilliser gun. The American hunters have not been charged. “These defendants tricked, lied and defrauded American citizens in order to profit from these illegal rhinoceros hunts,” said US attorney George Beck. “Not only did they break South African laws, but they laundered their ill-gotten gains through our banks here in Alabama. 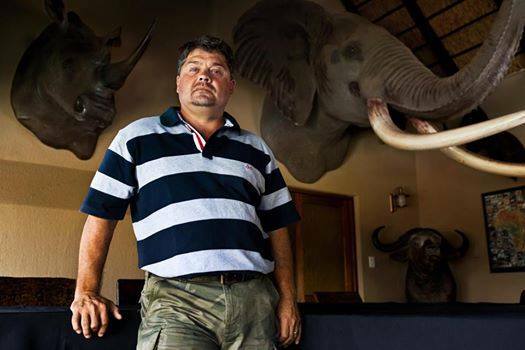 Dawie Groenewald and 10 others have also been charged with crimes linked to rhino poaching and fraud in South Africa.